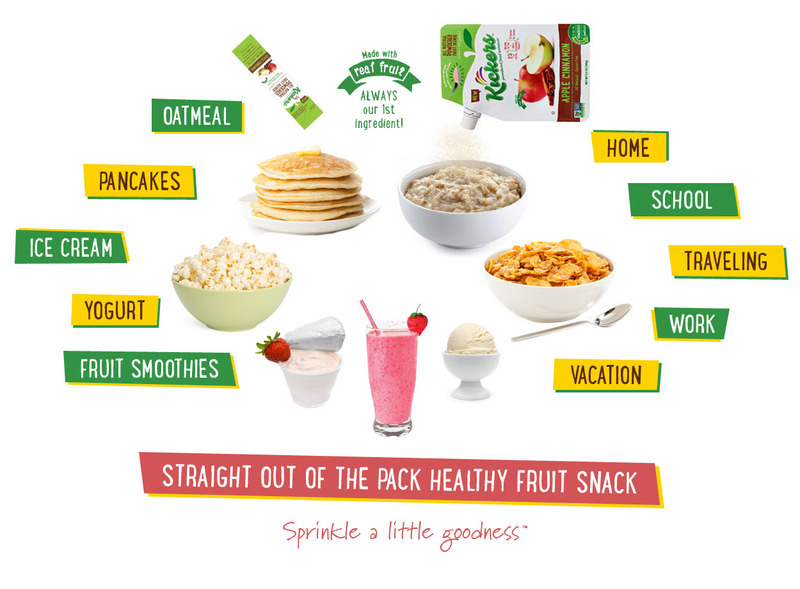 Kickers® is a Brand New, 100% Natural Gourmet Fruit-Based Sweetener and Dessert Topping. Sprinkle on oatmeal, pancakes, waffles, toast, bagels, baking mixes, ice cream, cottage cheese, popcorn, yogurt, fruit smoothies, protein drinks, hot & cold cereal, and so much more! They're also delicious straight out of the package as a better-for-you ready to eat fruit snack! Convenient and portable toss a stick pack in your purse, briefcase, gym bag, child's lunch box, or grab one on your way out the door for a quick, delicious, low sugar, portion controlled snack. They're perfect for parents, kids, health & fitness enthusiasts, bakers, chefs, and everyone else! Got Finicky eaters? Problem solved! Add some Kickers to those bland tasting vegetables and get your kids to eat more of the foods they should and less of the foods they shouldn’t. REAL FRUIT is always our FIRST ingredient including delicious ripe bananas, sun-kissed strawberries, and crisp apples. On average, just 3 servings of Kickers equals 1 USDA Serving of Fruit. Other ingredients include organic peanuts, non-alkalized cocoa powder, hormone free milk, pure cinnamon, natural vanilla bean, and real maple sugar. Each serving contains just 15 or 20 calories and is naturally low fat or fat free.